Your main goal in audio mastering is to replicate the sonic qualities of a well professionally mastered commercial song, in the same genre and style as the song mix you are working on. Yes, everyone has their own slight preference adjustments like a little more bass, brightness, etc., but overall you want to be at least 80% similar to the current industry standard. The only exception is if a client specifically requests an old school master. If that's the case, then you're going to have to replicate the sonic qualities of songs from a past era (specified by the client). Once every couple months, a client tells me they don't want their songs to sound like songs on the radio, because they don't listen to the radio. That's a good reason. Ha! Then they give me a few crazy mastering requests like "Make my song's volume level -8db below industry standard, or keep the song real muffled, etc." Genre Hip-Hop, "I want my CD to sound soft and analog." Ok, you want me to master the first soft analog Hip Hop CD? I talk more about this at the end of this article. Genre Heavy Metal, "Can you make my CD soft and warm." That's like saying, "I want an ice coffee, but can you make it hot?" Or, "I'm buying a Ferrari because I like to drive real slow." When this happens, I pretty much refuse these requests. Here's why. Any song I master is at some point going to be played along with other professionally mastered commercial songs. If a song is very poorly mastered and way off industry standard, it will be painfully obvious to any listener when played right after a professionally mastered commercial song. When I first started in the mastering business, I did whatever crazy request a client gave me, they approved the masters and paid the balance. Job well done. Or was it? 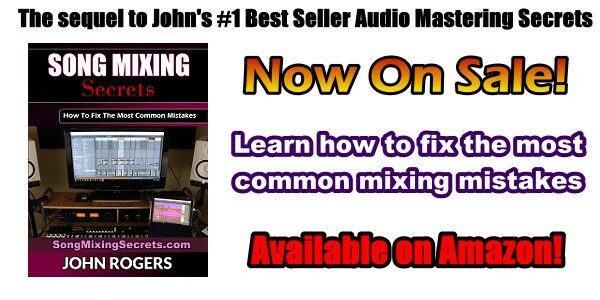 Note - This is also why the customer isn't always right when it comes to audio mastering. The problems came weeks later after their family and friends listened to these ridiculously poor masters. That's when I got a nasty "You don't know what you're doing" email and a demand for a full refund! Even though I gave them exactly what they asked for. My Point Proven - While writing this book, a guy uploads 20 hip hop songs. I master an initial preview (like I have 10,000 other hip hop songs) and upload it for him. He tells me him and his producer want the songs warm and analog sounding. I tell him no one has ever requested warm analog hip hop songs in my 17 year career (which should mean something). They don't care. They know more than I do about audio mastering. So, I send him another preview with the bass up and brightness cut, a nice warm hip hop song. Also, I noted this is wrong for hip hop. He tells me its great, that's exactly what he's looking for! I proceed to master all 20 songs this way (which I told you not to do in the previous paragraph). Ha! Update - The guy got all 20 warm analog hip hop masters, but I didn't hear from him for about two months. Then I get an email requesting a refund of his 50% deposit, because him and his producer don't like the warm analog hip hop songs. Really? I'm so surprised they didn't like songs that have the OPPOSITE sonic qualities for their genre! Shocking!! Since the client went past the 30 day money back guarantee, his 50% was kept as a non-refundable labor fee. Just another example of why you don't go against the standard sonic qualities of a genre. The general public is used to, and expects, the sonic qualities of today's music. This is why your goal is to try and replicate it. If you don't, the general public will know it. PERIOD!